Over the last decade the term Internet of Things (IoT) has attracted attention by projecting the vision of a global infrastructure of networked physical objects, enabling anytime, anyplace connectivity for anything and not only for anyone. IoT refers to a world where physical objects and beings as well as virtual data and environments, all interact with each other at the same space and time. 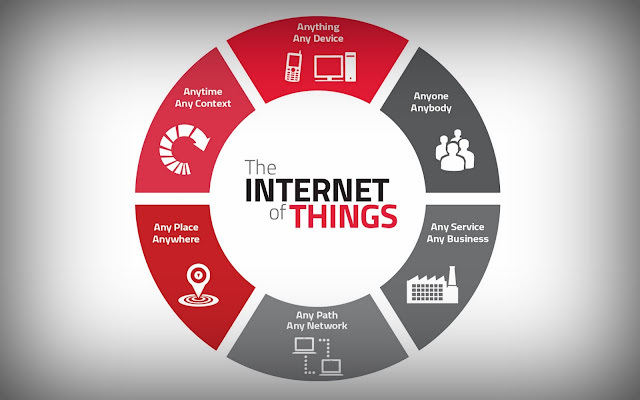 IoT was initially inspired by members of the RFID development community, who referred to the possibility of discovering information about a tagged object by browsing an internet address or database entry that corresponds to a particular RFID. In this way, real-world everyday objects acquire unique digital identities and can then be integrated into a network as well as be associated with digital information or services. Everyday objects include not only the electronic devices we encounter and use daily and technologically advanced products such as equipment and gadgets, but “things” that we do not normally think of as electronic at all— such as food, clothing, and furniture; materials, parts, and equipment; merchandise and specialized items; landmarks, monuments and works of art; and all the miscellany of commerce, culture and sophistication. A very recent survey on the IoT states that unquestionably, the main strength of the IoT idea is the high impact it will have on several aspects of everyday life and behavior of potential users. From the point of view of a private user, the most obvious effects of the IoT introduction will be visible in both working, domestic and entertainment fields. In this context, independent living, enhanced learning and entertainment, e-health and automotive are only a few examples of possible application scenarios in which the new paradigm will play a leading role in the near future. Similarly, from the perspective of business users, the most obvious effects of the IoT deployment will be visible in fields such as, intelligent manufacturing, logistics, retail, supply chain management, product lifecycle management, reliable and safe transportation of people and goods.The aforementioned potentialities and perspectives of IoT are considered highly challenging by the US National Intelligence Council (NIC), which includes IoT in the list of six ‘‘Disruptive Civil Technologies” with potential impacts on US national power NIC foresees that ‘‘by 2025 Internet nodes may reside in everyday things—food packages, furniture, paper documents, and more”. It underlines the major opportunities that will emerge, starting from the attitude that ‘‘popular demand combined with technology advances could drive widespread diffusion of an IoT that could, like the present Internet, contribute invaluably to economic development”. In this direction, several research activities focus on linking tens of thousands of sensor networks using a convergence of technologies that will allow companies and individuals to keep track of every physical item on earth at every moment. The above as well as several similar studies envisage an IoT architecture, the potentialities of which are inevitably limited by the dichotomy imposed by RFID nature, i.e. the heterogeneity between the plain and passive RFID tags and the networked RFID readers. In order to overcome this restriction, some researchers are working towards an alternative architectural model for the IoT as a loosely coupled, decentralized system of smart objects—that is, autonomous physical/digital objects augmented with sensing, processing, and network capabilities. The ASPIRE research project, which aims at lowering software and integration costs associated with RFID deployment. To that end, ASPIRE is developing a lightweight, programmable, standards-compliant, integrated and privacy-friendly RFID middle-ware platform, along with a range of tools intended to facilitate RFID deployment. The BRIDGE research project, which configures a set of research, development and implementation tools to enable the deployment of RFID related applications taking into consideration the technical, social and educational challenges. The Perci framework, which integrates Web services and Physical Mobile Interaction (PMI) with tagged objects for everyday use. In the authors developed a suite of Web-based, user-level tools and applications designed to empower users by facilitating their understanding, management and control of personal RFID data. In order to overcome this restriction, some researchers are working toward an alternative architectural model for the Internet of Things as a loosely coupled, decentralized system of smart objects—that is, autonomous physical/digital objects augmented with sensing, processing, acting and network capabilities. In contrast with passive RFID tags, smart objects carry chunks of application logic that allow them to make sense of their local situation and interact with human users and other nearby smart objects. They sense, log, and interpret what is occurring within themselves and the world, act on their own, intercommunicate with each other, exchange information with people and discover where they are, which other objects are in their vicinity and what happened to them in the past. The idea of smart objects and the IoT was recently popularized by Sterling. Sterling coined the term spime to describe a new category of space-time, location-aware, environment-aware, self-logging, self-documenting, uniquely identified objects that provide a lot of data about themselves and their environment. They also identified the smart-object design space as a space of three dimensions: Awareness, representation and interaction. An architectural framework for building smart object systems is described in the authors design an artifact framework for representing smart objects and a pervasive application model to leverage the services of smart objects dynamically. In a similar direction, the Hydra middle-ware allows developers to incorporate heterogeneous physical sensing devices into their applications by offering easy-to-use web service interfaces for controlling any type of physical sensor devices irrespective of its network technology. It also incorporates means for device and service discovery, semantic model driven architecture and security. 1) RFID tags are widespread among all aspects of daily life and furthermore, are cheap and easily produced. Envisaging a future IoT without RFID tags and readers is rather utopian. 2) The research on nano-electronic devices and polymers electronics is used for developing cheap, nontoxic and even disposable electronic sensors and objects that include logic. This development will enable the production at low cost of smart objects which will surpass their limited predecessors, RFID tags. A high-level approach of the proposed IoT architecture is illustrated in Figure 1. The innovation of the proposed architecture originates from the initial consideration of IoT integrated vision. The applications developed on an IoT architecture compromised by RFID tags are limited to identification and tracking. 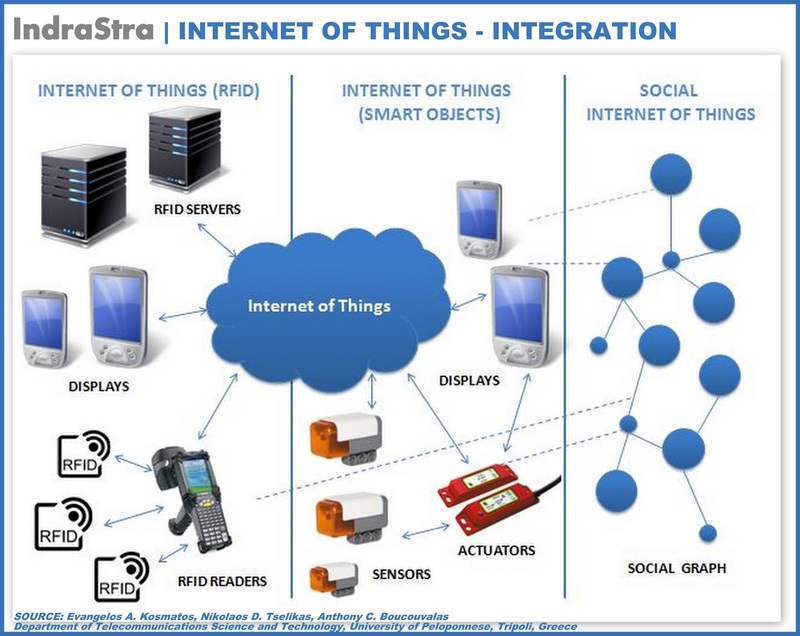 The integration of sensing and acting smart objects into passive RFID tags would enable the integration of a lot of completely new applications into the IoT context, spanning from sensor and automation specific applications to combined inter-domain applications. In the latest book of the Cluster of European Research Projects on IoT, published in 2010, the domains that will be accelerated by the implementation of applications adopting the IoT concept are described in detail. The authors report that the domains that will be highly affected by IoT datum will include: Automotive, intelligent building, telecommunications, health-care, aerospace, aviation, independent living, pharmaceutical, retail, logistics, supply chain management, product life-cycle management, environmental monitoring, people and good transportation, safety, security, privacy, agriculture and breeding, media and entertainment, insurance and recycling. In addition, the integration of passive objects (RFID tags) with active objects (smart objects) generates the potentiality of positioning chunks of application logic to selective locations into the IoT framework. The RFIDs architecture approach—limited by its nature—places logic into RFID reader and core components (e.g. Servers on internet). On the other hand, smart objects architecture approach tends to position application logic into local smart objects. The proposed architecture enhances the “Service composition” procedure with the potentiality of preselected or adhoc allocation of application logic into the available building blocks of the IoT architecture. This flexibility allows, firstly, the composition of different versions of the same application according to different requirements and secondly, the formation of several ways of application execution based on different parameter considerations: Connectivity, granularity, resources, energy, mobility, network topology, communication modality, flexibility and quality of service. Another innovation of the proposed middle-ware solution is that every object attached to the middle-ware is considered to have dual nature. On the one hand, it is characterized by its participation to a worldwide infrastructure of networked things. On the other hand, it is described by its social representation. Objects are able to form online communities, participate in one or more social networks and act as blogjects. The proposed architecture enables the creation and management of “social networks of things” composing the “Social Internet of Things”. The purposes of the creation may be variant: Creation of a “Grid of Things” with sharable resources to accomplish tasks, creation of a “social network of things” to expand the owners’ Web 2.0 social network, creation of a “blogject community of things” which combines their knowledge to search for specific insights and create blog posts, etc. 2) The dissemination of meaningful insights that, until now, were not easily circulated in human readable form. In the present study a unified IoT architecture is proposed integrating the two major trends in the area of IoT architectural models, while, in parallel, it exploits the social aspect of participating objects. The RFID approach, despite its simplicity and scalability, is inevitably restricted by the dichotomy of RFID tags and RFID readers. The smart objects approach is applicable only to objects supporting complex functionalities and therefore, limits the scope of IoT. The proposed IoT architectural model introduces a more generic IoT architecture by integrating both the RFID and smart object-based infrastructures. In this framework, RFID tagged objects are considered to be objects supporting primitive functionalities, while smart objects are objects supporting complex functionalities resulting in a superset of objects. In addition, every object attached to the infrastructure is considered to have dual nature. On the one hand, it is characterized by its participation to a worldwide infrastructure of networked things, while, on the other hand, it is described by its social representation. 2) extending the social scope of the proposed architecture by studying the human-object interaction, especially in social network environments. Evangelos A. Kosmatos, Nikolaos D. Tselikas, Anthony C. Boucouvalas, Department of Telecommunications Science and Technology, University of Peloponnese, Tripoli, Greece.